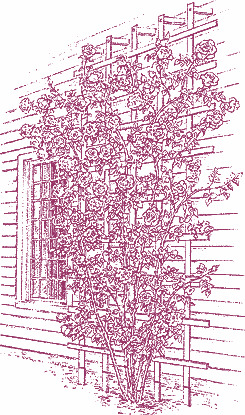 Brighten up the side of a house, or trellis by training your roses to defy gravity. In reality, no rose actually possess tendrils that enable it to cling by itself to a vertical surface. 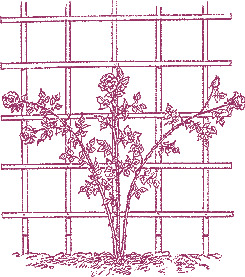 But because certain roses grow canes that are extra-long due either to genetic mutation or hybridizing , and because such plants when tied to trellises, arbors, or other structures can be truly stunning most gardeners are happy to go along with the misnomer. 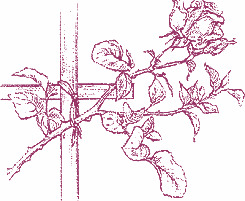 Like other roses, climbers produce their best bloom on the youngest stalks (or canes) that have appeared in the past year or so. New canes will, in fact, continue to sprout from the base of the plant at the rate of one or more a year, constantly renewing it. Roses need air space around them—especially in hot weather, when the heat of a wall can cook them. A freestanding trellis or fence provides such circulation, but if you want your climber to creep up a wall be sure to position its support at least three inches away from the surface. As a cane needs support to keep from drooping, tie it up. Use string or strips of cloth in lengths of eight to 10 inches. First tie the string tightly around the support, then loop it around the cane and tie it very loosely to avoid binding or constricting the tissue. Guide the canes to form a fan-shaped pattern. As a cane approaches a desired height, begin training it sideways so that its tip will start growing more or less horizontally. Although at first this will place much of the bloom out toward the edges, you can fill in the lower and inner areas with the younger canes that will keep appearing from the base. you’ll get better flowers on canes that grow horizontally rather than vertically. prune the newer canes with some restraint so as to keep young shoots appearing throughout the bush.